No, it doesn't have the impact of the student sit-in to protest the Vietnam war that took place at Stanford in 1966. But you might consider this to be the 21st Century version of that event. Students from the California university staged a protest this past weekend at the Apple Store in Palo Alto to protest device addiction. More specifically, the group (named Stanford Students Against Addictive Devices or SSAAD) were complaining that Apple wasn't doing anything to stop users from constantly checking their iPhone and iPad devices. Holding signs in front of the store in protest of Apple's lack of action, the group is demanding that the company devise a way to stop owners of Apple's mobile devices from constantly checking the screens on the products in their hands. A graduating senior at Stanford, Sanjay Kannan, brought up the results of a 2016 poll conducted by Common Sense Media, which found that 50% of teens are addicted to their handsets while 69% of parents check their phones hourly. SSAAD is asking Apple to include an app with the iPhone that can track "phone usage and clearly reports patterns." Currently, iPhone users can track how long they are using each app as a percentage of total battery usage over both 24-hours, and 7-days. Back in January, Apple said "We are constantly looking for ways to make our experiences better. We have new features and enhancements planned for the future...we think deeply about how our products are used and the impact they have on users and the people around them." 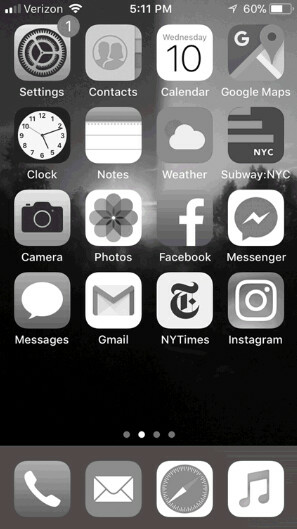 Apple did point out that users can set their iPhones to "grayscale mode," which removes color from the phone and makes the display less attractive to look at. But the SSAAD wants more. They would like to see Apple develop an "Essential Mode" which would disable all functions of an iPhone except for the phone, text and photos features. People... these things are tools. I suggest you use them as such. Also, author made a horrible comparison in the article. Next on news "Bunch of drunkard protesting beer companies"
America's best and brightest.....we're doomed. Earth to entitled little liberals.....companies make products to appeal to consumers - not to make them not want to use them. The more appealing they can make the product, and the more demand they create - the more money they can make. These are the people who make a dramatic post about how they are done with Facebook. See you in a month. How can some be addicted to a crappy boring phone.......oh wait Sheep will be Sheep! Same goes with the android. If majority of people around the world use android handsets. How come android be also not a source of addiction? Because have a different mind set, they worship apple like a god. Ditch facebook...that would be a good start. But seriously wow...we live in an age where our mistakes and misfortunes are the fault of others. Black Lives Matter, Me Too, Feminists, Antifa, The Ungovernables...such a sad state for humanity. How much further are we going to digress as a species??? There are more Android users than there are iOS users...will a protest be launched at the Samsung booths in all the BestBuy's now, or do they have better and more productive things to do with their time??? I guess we're not allowed to be addicted to our Samsung devices. A shame. I get the point but it's also possible to have an iPhone without apps that would keep making you check it. It's not like Apple preloads Twitter, Facebook, etc. Guessing these people have never heard of feature flip phones? It has a camera, you can text on it, and hey...it even makes phone calls... everything the entitled are asking for. *Update* Student was struck by a driver who was texting. I'm addicted to my Note 8, but I'm not honking. Yeah, nothing won't stop us from using our devices. Everyone has their own damn reason and there it is - it's our business as to why, when and for how long we use them. People who don't see the point or just don't have a reason to use all of the main functions of a smartphone can easily get a feature phone. Where's the problem? If anything, promote that instead of protesting and asking for impossible ? ? Nokia has released a couple devices for that, haven't they. Thank them for doing that. Honey, I got literally nothing else to do in my life other than die in front of my tablet to draw. If I didn't have my phone I would probably be bored to death. I got nothing else better to do. Hence I'm always either on my phone or tablet. inb4 everyone goes on a rant on how stupid liberals are. remember - vocal minority. Wonder why always on display on android leaves a lot of screen burn ins compared to apple devices. The iPhone doesn't have a notification LED? You're kidding me? I'm not joking, I never knew that. That's insane. Protesting their own addictions? Calling themselves “SSAAD”? This reads like a comedy skit, or an article from The Onion. How is that Apple's fault? They need to learn to take a break from their iPhones. Isn't hard to do at all. Just mute notifications and that does the trick. OMG this new generation is pathetic. You sold me this device and you do nothing to prevent my addiction! How is it Apple's fault? Without the iPhone they would still be hooked on social media and the web, they would still be narcissistic self absorbed selfie taking idiots. I guess next they want Microsoft to do something about PC addiction, their ISP to stop their internet addiction, McDonald's to be responsible for obesity, Ford responsible for speeding etc. These kids need to learn self control and responsibility.